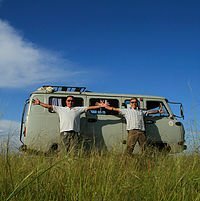 Meet the team behind the computer screen – Goyo and Olly, designers and organisers of your next great adventure, and the fantastic team of guides and drivers who work tirelessly in front of and behind the scenes to make your Mongolia holiday so unique and memorable. Where would we be without the wonderful, spirited Goyo? Well, for a start, we'd just be called plain old 'Travel'. 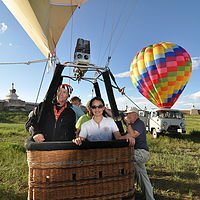 As the figurehead of the company, she embodies everything that is great about Mongolia - local, friendly, hospitable, and culturally enriching - instilling these qualities into the content and execution of our expertly crafted itineraries. Born and raised in the Gobi, Goyo has forged a successful career in tourism, working first as a guide, before attaining a Masters in Tourism Business & Management and working for several years as Operations Manager for a renowned specialist Mongolian tour operator. 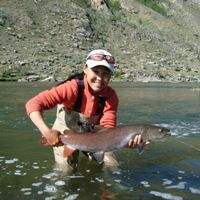 She won a coveted global guiding award from Wanderlust Magazine in 2007, and has travelled extensively throughout Mongolia and abroad, with her cross-cultural insight contributing invaluably to Goyo Travel's success. Goyo oversees all logistical operations for all our trips, her unflappable calm belying an enormous capacity for multi-tasking and dealing with the demands of a busy travel season. Also volunteers her time for the Gobi Oasis Project. Olly first travelled to Mongolia in 2006 on a working holiday, where he fell in love with Mongolia - and Goyo(!) - and has since made the country his second home. After 6 years working for a specialist Mongolian tour operator, he and his wife launched Goyo Travel in January 2013. Olly grew up in Cheshire in the North-West of England - famous for salt, cheese, cats, and dodgy accents - before attaining a degree in Modern languages from Edinburgh University and pursuing a career in advertising in London. After a career re-appraisal and sabbatical, Olly spent a winter season on the slopes running a chalet in France, but has yet to sample the delights of skiing in Mongolia at -40 degrees! A love of travel and outdoor activities - riding, golf, tennis, walking - combines with a penchant for no-less competitive indoor activities, including snooker, scrabble, bowling, karaoke and drinking ale. He can also often be found driving at high speed to the deafening sound of 80's rock. Tuul is a invaluable cog in the Goyo Travel engine - when she is not guiding she works from our office in Ulaanbaatar, involved in many aspects of our business, from itinerary research through to its execution. Having spent a lot of time in England in the hospitality business, she has an intuitive understanding of our clients needs, and is both attentive and resourceful without being over-bearing. Rarely seen without a smile on her face, and always up for any challenge, she is always a delight to have around, and we are lucky to have her as part of our Goyo Travel Mongolia team. Zolo has worked in the tourism industry most of her life. She obtained both a BA and Masters in tourism from the Education University of Mongolia and from a University in Malaysia respectively. Her first job was in a Ger camp as an assistant manager, afterwards she moved to work for one of the leading domestic airlines in Mongolia. She now works in our office as our Reservations Manager, where is she diligently books all of the ger camps, transport and flights that make your Mongolian experience possible. As well as being a caring and friendly lady. She is a fantastic addition to our team. Yondon is a young, dynamic student who works for us full time. His duties include accounts work - bookkeeping, making transactions, checking receipts - plus computer and IT support in the office, in addition to any other tasks we set him such as finding the best muffins in UB for our packed lunches. He is never happier than being at his computer with an earpod in his ears and a lollipop in his mouth. Charlie is a new member to the Goyo Travel UK office, and has joined us with a wealth of travel knowledge, and previous experience of the travel industry through work and college. Charlie is an enthusiastic, adventurous person with an eye for detail, and also provides good manual handling and technical knowledge to the team. He can go from fixing your phone and sorting any technical issues to building a fire and putting together a ger without hesitation. Having travelled all over Europe, North America, Sri Lanka, and spent a month in Ghana, Charlie has done everything from volunteering, horse riding and abseiling in the jungle, to mountain climbing and kayaking great lakes. A real people person, Charlie will go the extra mile for our customers to ensure they have the experience of a lifetime. In his spare time he loves to play football, walk his dogs, cook and learn new languages. One of the younger members of the team, Puntsag is a very dynamic, talented young man, who can fix pretty much anything from broken chairs to tents. Polite to a fault, he never says no, will always lend a hand when he can and is full of patience. He is one of the team that packs the equipment that you will use on your travels. During the summer he often rises early for trip departure and leaves late after packing for the next. He is often found heading to the market to find the items for the more unusual requests from clients. Although he is always working hard he sometimes finds time impresses the office with his cooking skills. His specialities are two Mongolian dishes - Tsuivan and Budaatai Khuurga. One of our most recent addition to the Goyo Travel Ulaanbaatar team, Batu is a friendly and patient person, and assists in wide range of office activities. He spent more than 10 years travelling around Asia and recently graduated from a university in Taiwan. In his free time he's found behind computer screen researching world history and scribbling down amateur poetry. 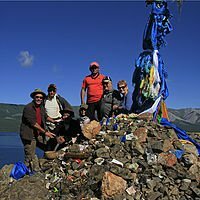 We have a fantastic team of experienced and dedicated English-speaking local Mongolian guides, trained by us and instilled with our Goyo Travel ethos. Many of them have worked with us for years - some even take annual leave from their permanent jobs to lead trips for us! 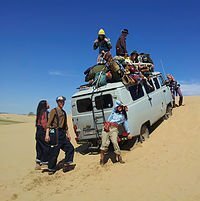 Mongolians are by nature warm and hospitable, and your guide will possess these qualities combined with a refined balance of other key attributes -knowledgeable, resourceful, energetic, proactive, intuitive, intelligent, sensible, flexible, sensitive to your individual needs, and attentive without being overbearing. We aim to match guides carefully to suit the dynamics and requirements of each set of guests. It is important to do this, since the guide will be with you for much of your journey. The central office team take great pride in personally briefing all our guides before each trip to cover every element of guests' needs and expectation - from the basic nuts and bolts of the itinerary schedule, to specific considerations based on our knowledge of each guests' interests, personal preferences and requests, plus special touches such as birthday and anniversary surprises. Typically there will be 1 guide per trip. For larger groups you may have an assistant guide, and/or a Western tour leader. We provide guide and pick-up details to all guests at least a week in advance of your journey. Only once you have been to Mongolia will you truly understand the skill, knowledge, stamina and dedication it takes to be a driver. The word itself does little justice to the importance and diversity of their role, their involvement in each trip and their contribution to guests' experience of Mongolia. Our drivers all own their own vehicles - taking utmost pride in their care, and the safety and comfort of all of our guests. Although they generally speak very little English, language is no barrier to their invaluable interaction with the group and their enormous contribution to the success of any trip. Whilst getting you from A to B, they do everything from A to Z. They know the countryside like the back of their hand, even without maps and road signs - or roads! They are able to deal with all types of conditions, and are expert mechanics if the need arises. 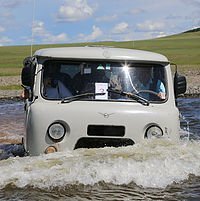 They also know the best picnic spots, local families to stop at, and with sharp eyes they are always spotting and pointing out wildlife - in between renditions of traditional Mongolian songs. 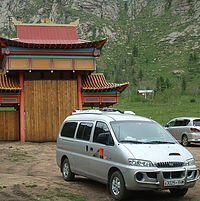 Nothing is too much trouble for these guys - between stints behind the wheel they help with luggage, equipment set-up, lighting fires in gers, archery demonstrations, and teaching guests a bit of Mongolian.